I – (Sep 29-Oct 5) I was pretty busy this week so Jeff cooked most of the meals. He will have to share exactly where the recipes came from and what he adjusted, but all I can say is that it was delicious. 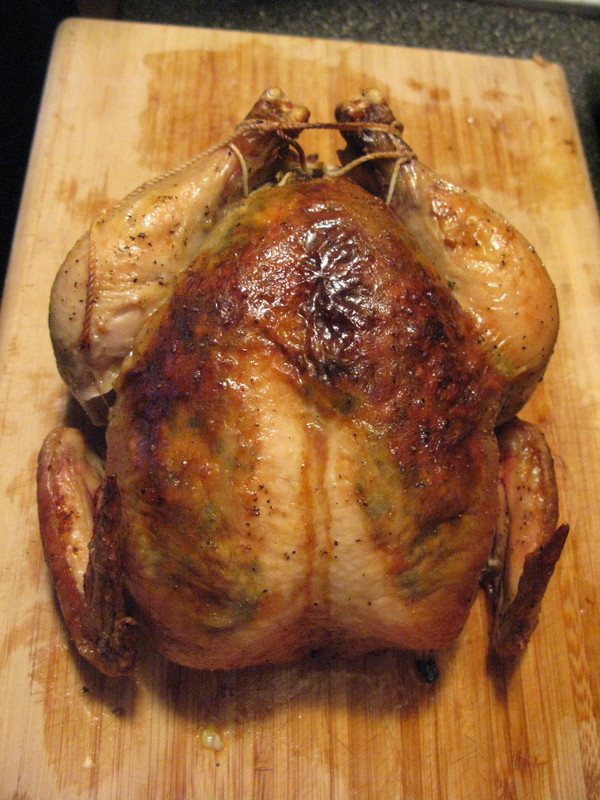 The only photo we have for that week is of the gorgeous roast chicken. We also did a slow pot roast, quick microwave corn (literally put one cob in the microwave for 2 min and it’s done), some salads, and we used the turkey sausage for Sunday breakfast. My two contributions for this week’s meals were to make chicken broth with the chicken bones and gizzards (we used all of it for the pot roast), and a recipe of squash with onions (explained here). J – The chicken was actually really easy. 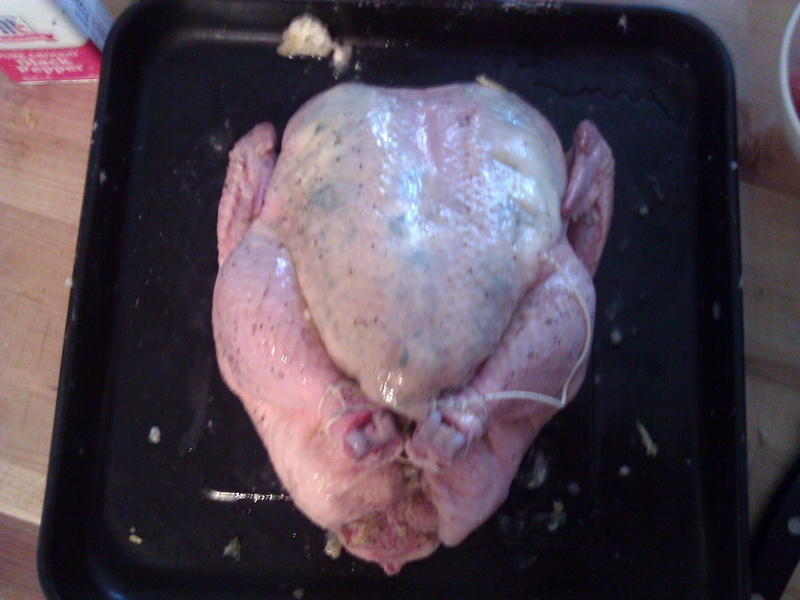 I rubbed the skin with olive oil, salt, and pepper all over – top, bottom, under the wings/thighs, and the sides – and then mixed softened butter, garlic, chopped thyme, parsley, rosemary, zest of a lemon, and a little salt and pepper together and stuffed it under the skin on top of the breast. The trick is to spread the herb butter evenly under the skin – don’t let it clump or you will have one very buttery bite and mostly unseasoned chicken breast. This way, the herb butter cooks into the skin and breast meet instead of roasting on top of the skin and melting into the pan. Before you spread the butter, use your fingers or a floppy spatula to separate the skin and meat, being careful not to rip the skin. I squeezed the lemon into the cavity and stuffed the chicken with the squeezed lemon and the rosemary and thyme springs (I snipped some off of several plants we have growing in our apartment). Then I just tied the legs together with kitchen twine and roasted it until the internal temp was ~160F – it’s really, really good. For the pot roast, I browned the beef on both sides after rubbing it with salt, pepper, and just a little olive oil, then I threw it into the slow cooker with chopped onions, carrots, and garlic and seasoned with rosemary, thyme, and a bay leaf. I topped it off with some chicken broth and let it cook on low for about 6 hours – it was delicious and mostly involved me waiting patiently for it to be done. The corn was incredibly easy. If you’re like me, you remember corn on the cob slathered in butter fondly from your childhood. However, husking corn can be a chore – most people boil the corn and then de-silk each cob. It takes forever. I found out that an easier way is to put the whole ear in the microwave for 4 minutes, take it out, – carefully, using oven mitts (it’s HOT) – cut off the wide end, and shake the ear out. Viola – a clean, cooked ear of corn. Season with some butter and maybe salt and pepper and you’re good to go. Don’t listen to her. I will be deep frying things. So many things.